"the bearing itself is seated properly, the bolt covering it too long resulting in the gap. Previous AM1000 did not even have this cover on the bearing-retaining bolt. I don't know if it is resolved." We are improving the bolt covering to fit surface better now. I will upload some photo tomorrow. About gear sensor, we will add it as a basic offer if most of customer need it or it can be choose depend on your demands. if add a gear sensor, it will protect the chain and cassette better and it require some riding skill when you use it during climbing, otherwise, sometimes, it can shifter properly or in right time because of the power cutting when shifting. Placed an order for the base bike - about 1 month delivery estimate. suspensions upgrades are always nice. However, I saw someone mention they upgraded to Sram EX-1 groupset (e-bike reinforced derailleur, chain, and 8-speed cassette) from Frey (to be confirmed). IMO, this is the better upgrade this bike can have, the stock 11-speed XT is not rated at all for this much torque... If I recall, someone in this thread already experienced cassette failure. I did request a couple of spare derailleur hangers. I also asked about a second wheelset so I could quickly convert to more road-friendly tires, but they weren't able to oblige. Any recommendations for a suitable wheelset/tire/cassette/hub combo and where a good place to get them from is? Will 29ers work? DT Swiss Hybrid series are very nice, H1900 for the entry level, H1700 middle, or HX1501 for higher end, ranging from 300 to 800 eur from german sites like bike24 or bike-discount, they both have cheap worldwide shipping. These wheels all feature hubs with oversized bearings, hardened steel freehub bodies ( --> no spline-gouging under extreme torque), oversized spoke interfaces, reinforced spokes and much stronger rims. They are available in both 27.5 and 29, each with different rim widths. AM1000 frame compatibility with 29er will have to be checked tho. Has the ill-fitting bearing issue been sorted on newer bikes? (ie, someone reported a suspension bearing couldn't be fully seated and left 1-2mm gap that might allow dirt/debris to enter?). the bearing itself is seated properly, the bolt covering it too long resulting in the gap. Previous AM1000 did not even have this cover on the bearing-retaining bolt. I don't know if it is resolved. you would be better served by any aftermarket 130BCD chainring like the narrow-wides from RaceFace as Bafang ones a stupidly heavy. For climbing ability I would even go to a lower teeth count. I'd like to do some night riding on trails and am considering the Fisher Fab light https://lunacycle.com/fisher-fab-house- ... ike-light/ Is this light something that could be powered from exising wiring, or would I have to splice new wires? existing wiring will not offer the connector of this lamp. The motor does suplies a 6V light line controlled by the Display buttons / light sensor but it's current rating and voltage are too low for this lamp. You'll have to tap into the main power line running from the top of the downtube (where the battery connector is) to the motor (terminated by an Anderson connector). Not an hard job IMO. Finally, does this bike have a GearSensor? And if not, do people recommend adding one? the motor does have a Gear Sensor input. Needing it depends on if you can get in the habit to use the ebrakes as a clutch on gear shifts, otherwise you don't need it. Repeated shifts under power will lead to (very) premature chain failure. With the much lower torque BBS02, I snapped multiple times the same KMC X11-e (e stands for e-bike) chains that Frey use. The connector from the motor to the gear sensor will have to be checked, it's not a circular Higo as on other BBS systems. Great video! Bet the dog was tired after that. good news ! This will protect the bearing better. I will see If I can file / cut down mine to make it fit properly. Also, if you can, try to improve the surface finish & machining quality/tolerances of the standalone bearing covers (the pair to the bearings in the middle of the seat tube). If they can match the quality of the other bolts with integrated cover, that'd be great ! About gear sensor, we will add it as a basic offer if most of customer need it or it can be choose depend on your demands. I think this is a basic need on a such a powerful motor + non e-bike rated drivetrain. If some riders don't like them, they can always unplug the sensor but leave it on the bike. haha, nice workout for the dog ! Good editing too ! Do you intend to trim the handlebar ? Your arms seems way too open with the current length. Or maybe you like/are used to ride like that ? Last edited by Ivanovitch_k on May 23 2018 4:10pm, edited 1 time in total. could someone please measure the rear thru-axle bolt ? I am used to riding like this but I was thinking about trimming it because there are some gaps where I struggle to squeeze through. Wow, that's a pain! Nice looking bike, first ride and something breaks. Not good! I have seen a derailleur damaged (pulled into the spokes and bent) before, not on a new bike but on a bike where someone had just fitted a wide-range cassette and a new chain. They had fitted the chain and adjusted the derailleur with the bike on a stand and it all ran well. Would have been fine if it was a hardtail, but they didn't allow for the full range of rear suspension movement, and the chain wasn't long enough. First big bump and the derailleur bent into the spokes. You said the damage occurred when you were in the lowest gear on the rear derailleur (largest sprocket)? And climbing a steep hill, so most weight would be on the back of the bike. That's when the problem would be worst, if it was the same issue. Also check the spokes to see if there are any marks or bends that would match the derailleur catching in them. 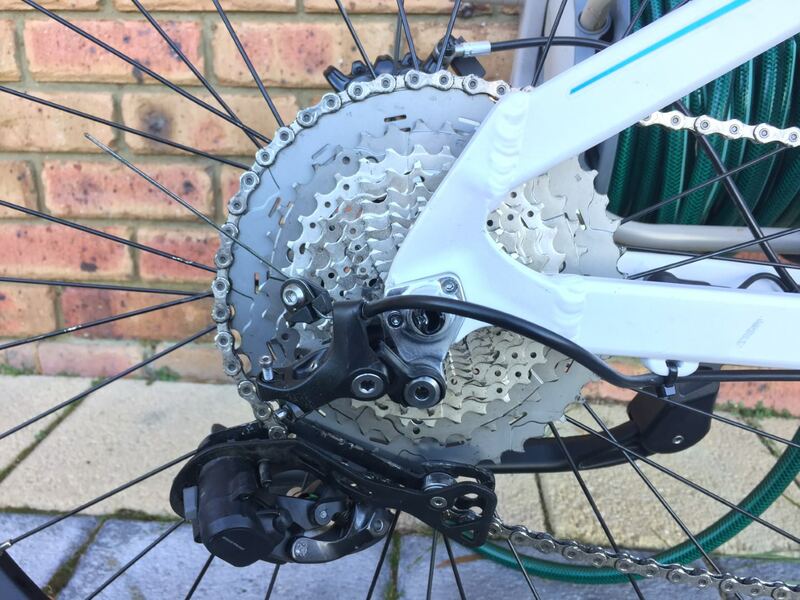 The photo of the bike "while the battery was charging" shows the chain on the biggest sprocket and the derailleur maxed out.. the lower run of chain not far off straight.. with very little extra movement available to allow for suspension travel, so I think this might be what happened to you. So, when you get the new deraileur, put it into the biggest front chainring (if more than one) and the biggest sprocket on the cassette and carefully run the suspension through its full range of movement to check there is enough chain length. You might have to let air out of the rear shock to allow the full movement to be tested. You might need a longer chain if it does get too tight. Hope you get it sorted quickly! Ivy @ Frey: If you read this, it would be a good idea to make sure chain lengths are tested at all positions of the back suspension as well as the "unloaded" position before the bikes are shipped. That makes a lot of sense Drum. Add to the mix that the sag was not set correctly (40% instead of 25-30%) and it looks even more likely. Have a look at this image I posted earlier. You can see sopke damage right where the derailleur would have hit just below the the middle left of the photo. Fantastic video. Are you a pro video producer? We can match the gear sensor as a standard equipment if customer want to have it. The bolt cover fit on surface better now. Also we are improving the standalone bearing cover surface finish now. we will make the one in black finish to make it looks better. Your info is useful to us. We will check and test more about the chain length. Thank you for all customers and friends here! Thank you for all your kind understanding and support and tolerate our non perfect now. We are improving more in details and accumulate more experience on the product to make it better and better. It gives us a feeling that we are not alone to make the product better. We are more like working together to make the product better and better. And just FYI, 7mm of the thread extends beyond the bolt and sticks out, if that matters at all. I'll update soon with some photos of the result (the sun set before I could finish). As for Light You could order this one from Aliexpress or Amazon. Just plug the USB connector to the Integrated cable and it work well. It can be control by the Controller Display to on off the light. Me and my Buddy bought this light and use in on our Ultra bike. "Very Bright"
That light needs 2.5A for it’s specified brightness. The cable can only provide 0.5A if it’s the same as the BBSHD. I’m not saying it won’t work, just that it could be brighter. You might be better off with a DCDC converter (48V to 5V) wired to the 48V battery. I purchased the Roxim X4 from Grin last night. About 10 times the price delivered (AUD) compared to what dalysea paid but it won’t blind oncoming traffic (StVZO) and I will be splicing it in to the the 48V battery supply as it can take up to 85V. I’ll post some photos when it arrives and I fit it. I’ll also show how I powered my 3V rear red light from the 48V battery. Sounds awesome, that would be great to see photos and learn how you powered the light on the back. One thing I like about this light is that you can point the side lights straight ahead or down toward the ground while the center light stays pointing forward. You can also choose 1) center light only; 2) side lights only; or 3) all 3 lights on. I'm afraid the only light I have to compare it to is a $20 USD Blitzu Gator 390 (my lights have been stolen twice now so I go for cheap) . It's tough to take photos of lighting since the camera makes adjustments for the level of light. But you can sorta get the idea. The Deroace has a nice spread of light and you can see more of the road ahead and to the sides. The Blitzu seems a lot brighter, but it is focused at the road directly in front of you. My personal preference is the Deroace. UPDATE: I read up on Straßenverkehrszulassungsordnung (StVZO) and realize my preference is wrong and could temporarily blind oncoming bikers, so I should definitely point my lights more at the ground directly in front of me. Last edited by dalysea on May 25 2018 8:09pm, edited 2 times in total. Great, look forward to see pics on how you do this and where you spliced in. I'm looking to install a Magura Vyron v2 2018 wireless dropper post (is faster-acting than original version). My concern is if there's enough insertion length to install the post - specs indicate I need 120mm inserted into the seat tube. Can someone please measure the seat tube to see if there is enough available non-constricted length? I quickly tried and fitted my brand-X Ascend XL dropper 150 mm all the way so you can look up the numbers to compare. Can someone please measure the seat tube to see if there is enough available non-constricted length? the straight part of the seat tube on the M-sized v2018 frame is 250mm, immediately after you've got an exit point for the dropper cable. Yea, I dropped in a Fox Transfer 150mm, into a 31.6mm opening. The hardest part for me was fishing the cable out to the neck.